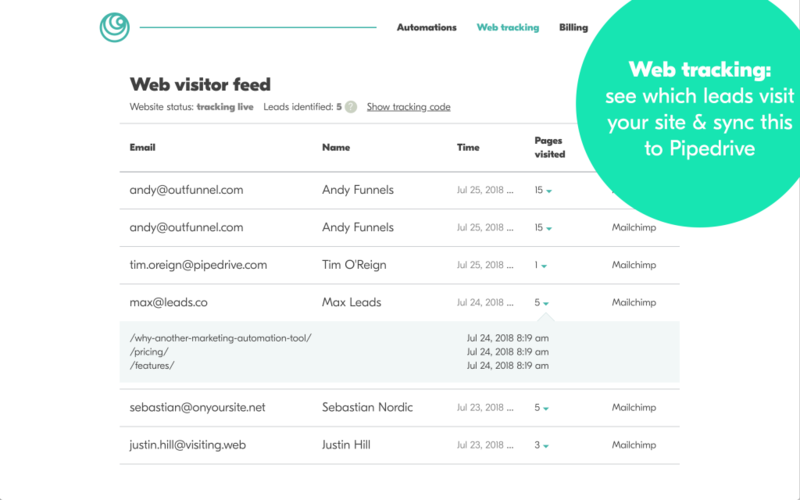 Our website visitor tracking feature, or simply Web tracking as we call it, shows you which of your leads are visiting your website, and which pages of your website. This way you’ll know who appears more interested in your products and services, more ready to buy. 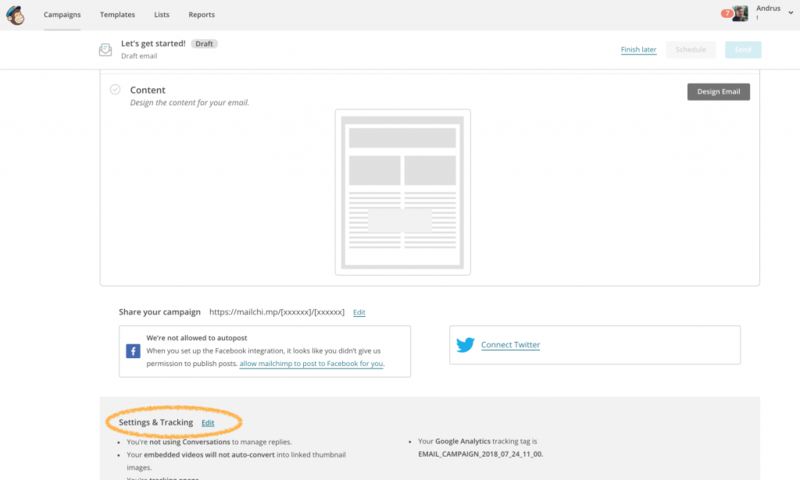 Outfunnel matches website visitors to your Pipedrive contacts, using Mailchimp’s e-commerce link tracking, so currently the feature is available for companies that use Mailchimp to send newsletters and who have connected their Mailchimp account to Outfunnel. We’ll soon be adding more ways to match website visitors to your contacts. Step 1. Add Outfunnel tracking code on your site. 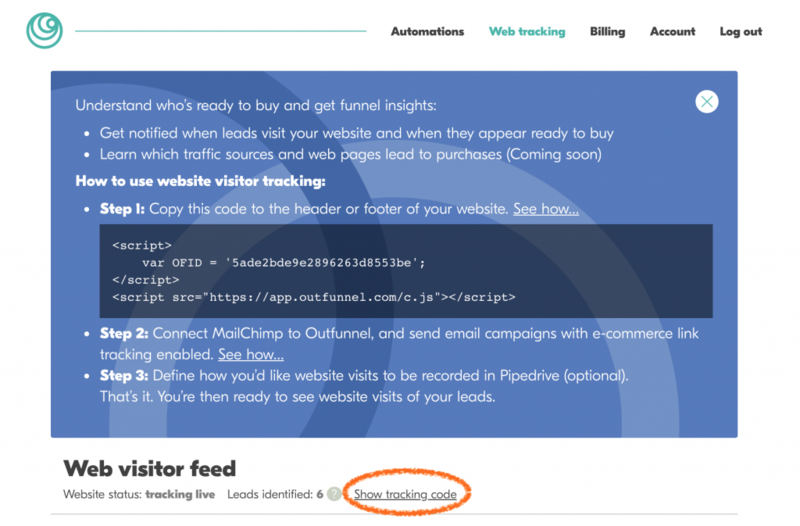 You’ll find your tracking code in the Web tracking section of your Outfunnel account. Read more about how to install website visitor tracking code to your site. Because we’re using Mailchimp’s e-commerce link tracking feature, you must have your Mailchimp account linked with Outfunnel. You can do that if you navigate to Connections section in Outfunnel and follow instructions there. Outfunnel uses Mailchimp’s e-commerce link tracking to match email addresses (and so, your leads) to website visitors. All you have to do to start tracking website visitors is to tick “E-commerce link tracking” every time you send out a campaign. First find Settings & Tracking as you’re composing a new campaign, and click Edit. Then tick the e-commerce link tracking checkbox. That’s it! Please note that e-commerce link tracking can be activated for both one-off campaigns and automated campaigns. For the latter, navigate to Campaigns > Ongoing and click on the name of the automated campaign. Then click on Edit Workflow Settings and tick the e-commerce link tracking checkbox. PS. The more people click on your emails, the more people Outfunnel can identify, so we recommend sending a campaign or two with a very attractive call-to-action or offer to increase the number of people we can identify. You’re then ready to start seeing website visits who have clicked on at least one Mailchimp campaign. We’ll show you the time of the visit, pages visited and the source of the visit. The source will be Mailchimp for almost all contacts but this will start to change as people return to your site via different sources. 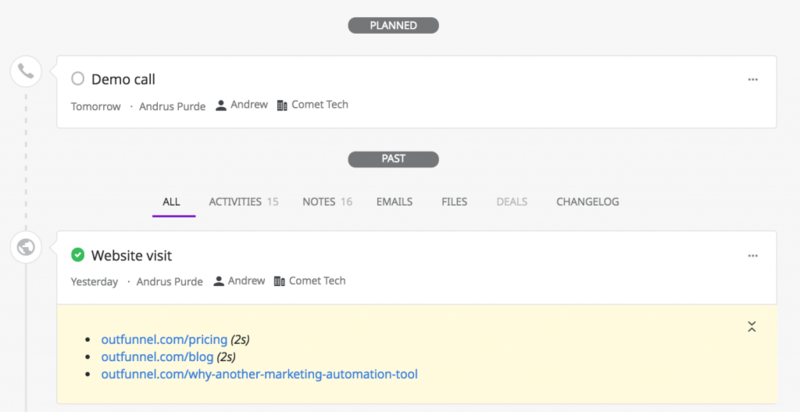 Go to Outfunnel > Automations, scroll to Outfunnel to Pipedrive automations and click Configure. There you can set up an automation to send web visits to Pipedrive, and you can choose whether to record website visits as a Note or as a custom Pipedrive activity called Web visit. In order to increase usefulness to salespeople we post web visits to Pipedrive with a 30-minute delay, so we can list all pages visited within the first half an hour, and the duration of looking at each page.